Happy Monday, I hope you all had a wonderful weekend and are ready for another week! Still in the Christmas mode here today. 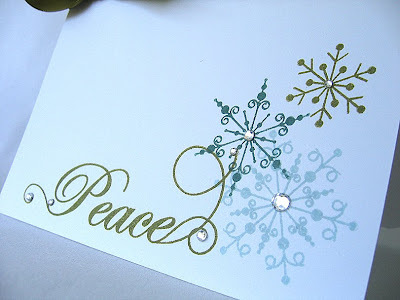 I've got another Moxie Fab Stretch Your Holiday Style Challenge card to share today. This card is my submission for the Classy & Elegant Challenge. It's super simple but that satin ribbon and those rhinestones give it great glitz and glamor. Look at that shine! I looks even better in person. I've been trying out a new background for my cards, thanks to some helpful info from Shannan. What do you think? Can you guys believe that today is the last day of August, where did the month go?! Christmas will be here before we know it! Thank goodness for these Moxie Fab Challenges, getting me into the holiday mood and giving me a head start on the season. Well, thanks for visiting me today! Hope you enjoyed the card, I've got one more holiday challenge to do then its back to the everyday cards. Have a wonderful Monday! Bye, bye! Hi all, hope you are having a great weekend! I have yet another Christmas card to share with you today. This is what I came up with for the Stretch Your Holiday Style: A Fun and Cute Challenge over at the Moxie Fab World Blog... My cute Santa was cut from some PP I have had forever. Since he was cut from PP he was a little flimsy. So in order to strengthen him and attach him to the card with dimension, I adhered him to white cardstock and then cut him out again. The "ho ho ho" is a rhinestone sticker I have had forever as well. It's good to finally use all these Christmas goodies I have been hording. I finished the card of with some polka dot scallops, floss and a rhinestone on top of cute little Santa's hat. Oh, can you believe it... not a single stamped image or sentiment on this card! I think that's a first for me on my blog. I had the hardest time trying to get the perfect shots with this card. I think all the bling was too much for the camera. The photos I posted were the best I could do and I'm still not very happy with them. It looks so much better in person. Oh well, you get the idea though, right?! Happy Friday to you all! Yeah, the weekend is just around the corner! 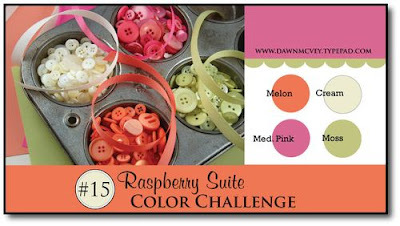 I am playing along with the Moxie Fab Stretch Your Holiday Style Challenges again. Today's card is for the Vintage & Shabby Chic Challenge. I am stepping way out of my element on this one... I went for more of a vintage style on this card. These stamp from SEI were the best images I had for something vintage. To add to the vintage feel I distressing the edges of the green stamped cardstock and the sentiment. The edges of the card base and the green cardstock were inked with Vintage Cream ink. To add the perfect vintage touch I pulled out my PTI vintage buttons... I stitch a row of my most vintage looking cream and brown buttons, then finished off the sentiment with one last button. So what do you think? Does it have a vintage feel to it at all? I've stretch my style on this one, so I'd love to here what you think! The weekend is almost here, Yeah!!! Do you have any big plans? I have my 10 year HS reunion on Saturday, hard to believe it already been 10 yrs! Well, hope you have a good one! Thanks for stopping by today! Happy Thursday! Today I'm playing along with the Moxie Fab Stretch Your Holiday Style: A Clean & Graphic Challenge. I know Christmas is still a ways off, but it's never too early to work on my holiday stash. Here is my attempt... Clean and graphic style is described as having white space, clean lines, and simple treatment of text. The purpose of these challenges is to stretch your own style and use styles you would not usually create with. For my card I went with a design that I would not normally think to use for a Christmas/Holiday card. I really like the way the "mod" flower turned out, it's funky and fun! So what do you think, would you call this clean and graphic? So stop on by the Moxie Fab World Blog and check out all the other challenges going on there too. Maybe you can give them a try! Thanks for stopping by today and hope you have a wonderful day! Hi all and happy Wednesday! Today I have another card made for the CAS (Clean and Simple) Autumn 09 Design Team Search. The sketch challenge is to make a card based off of this card. Here is my take... Very simple. I wanted to keep the focus on the flower. The flower was cut from my Blossom Nestabilities, I embossed the largest blossom with swiss dots. The remaining smaller blossoms I crinkled up, then layered the blossoms together and held them in place with a button and thread. Yesterday Blog Hop fun got me all excited about fall, so now I'm off to go bake banana bread! Mmmmmmm! Thanks for stopping by today and have a wonderful day! This is my favorite time of the year, what's not to love about this season! There is so much to be inspired by... the changing of the leaves, warm fuzzy sweaters, roaring fires, rich colors and so on. My choice for adding texture was embroidery floss (no surprise there since I've been using it like crazy) and a torn and distressed edge. I stamped my Beautiful Blooms leaf image in brown then added little berries by tying french knots with red embroidery floss. Wrapped more embroidery floss under the punched apron lace border and finished the card off with a sentiment and another cute little berry. I find it hard to believe that fall is just around the corner, but it can't get here soon enough! So what is your favorite season of the year? I'd love to know! Oh, and another note... I have been blogging for just over a month now and I'm loving it! I have been blessed to meet and become friends with many incredible and talented people through this outlet. Thanks to each and everyone of you who take the time to visit me! Well thanks for hopping by! Hope you enjoyed! 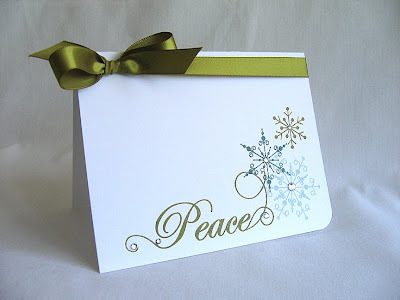 The card base is made from cream cardstock, even though it looks white. The butterflies were punched from melon and pink cardstock then crinkled, for a bit of a distressed look, to match the torn edge of the pink cardstock below. Then embellished with spring moss buttons. The vine border was inked in spring moss and the apron lace border was punched from melon cardstock. Finished the card of with a touch of cream twine and a sentiment. That girl always amazes me with her creative color combos! Aren't you amazed...No stitching or knots! :D Except for the buttons of course, but that doesn't count. Anyways, I hope you all had a fabulous weekend! Thanks for visiting me today, hope you enjoyed the card! Bye, bye! Hello all! Hope you are enjoying your weekend! Again with the embroidery floss, french knots and the In Bloom stamp set. I hope you aren't sick of them yet. :) This is such a cheery color combo, thought it would work well for a "pick me up" card. Sorry for such a quick post. I have company coming over for dinner today and need to prepare. What kind of weather are you guys having today? We are getting a little rain! I'm loving it, reminds me that fall is just around the corner. Hope you have a great weekend! Oh, and one more thing... I think I finally figured how to upload my pictures so that when you click on them, they enlarge. Hope it works. Bye, bye! Happy Friday!!! Yeah! Hope you all are ready for the weekend. Thank you all for your supportive comments about my masculine card from yesterday. There are 3 different challenges to participate in: Sketch, Color & Theme. Today's card is what I came up with for the Color Challenge: Monochromatic With A Twist. The rules are to use different shades of brown and just a tad bit of red. I only have one shade of brown and kraft cardstock, so I hope that kraft counts as a shade of brown too. For the "tad bit" of red I used embroidery floss and tied french knots to make my flowers. I also used the floss to wrap and tie around the bottom of the image panel. Well, thanks for stopping in and visiting with me today. I hope you enjoyed the card and hope you have a great weekend! Hello my friends! Ok, so today's card I keep going back and forth on whether or not to post it. So, I'm going for it...I better post it before I change my mind! This card was created for the CAS28 Challenge, to make a masculine card. This is definitely not my strong point, in fact it's probably my weakest! Masculine cards are always a challenge for me. I was going for Clean and Simple (but I think it may be a little to simple) and no frilliness. I used the same frame idea used on this card, just adjusted the size to fit this card. Rounded the corners of the image panel. Use black DMC embroidery floss for the cross stitches (along the sentiment and image) to match the buttons. So that's pretty much it. I'm not sure how I feel about this card. So please let me know what you think, good or bad, I can handle it! Thanks for stopping in today and have a wonderful Thursday! Hello there my friends! Hope you are having a wonderful day! First off I wanted to thank all of you for the super sweet comments you left for me about my good new! I am so blessed to have made so many new and great friends through my new blog. You guys are the best!!! So here is today's card... I whipped out the polka dots and heat embosser for this card. It's hard to see in the picture but along the edge of the bird image panel is a border of brown apron lace punched cardstock. The border stands out so nice in my original picture, but here it's really hard to see. For some reason when I post my pictures on the blog they do not look as good as the originals on my computer. Any of you have any suggestions on how to fix this? I'm still learning here and need all the help I can get! What do you think of my grounding effect, under the birds? This happened totally by accident, but I think it turned out kind of nice. Some of the ink on my stamp block came off onto the image panel as I was stamping the sentiment. I was upset at first (I seam to do this a lot, mess up my cards on the very last step) but then I realized that I could make it work. I just needed to continue the effect all the way across the panel. So I inked up the block (on purpose this time) and stamped the ground under my birdies. Kind of neat, wouldn't you say?! I'm definitely going to have to try this one again! Thanks for stopping by and I hope you enjoyed your little visit with me today! Cardstock: Aqua Mist, Vintage Cream & Dark Choc. Accessories: Raspberry Fizz Vintage Buttons & Twill Ribbon, DMC Floss, KaiserCraft Rhinestones, JoAnn's Clear Embossing Powder, Fiskers Apron Lace Border Punch & Corner Rounder. Happy Monday to you! Hope you had a wonderful weekend. I pulled out the good old needle and embroidery floss again and straight stitched a couple of rows (also stitched on that cute white button flower along the bottom, the flower detail is there its just hard to see in the picture). The polka dots were all embossed in clear embossing powder. Check out these cute button flowers... I really love how they hang over the edge of the circle. Thanks again for stopping in and visiting me today! Hope you have a wonderful Monday! I've had a pretty crazy day so far, nothing seems to be going right (praying for patience!). I started on it yesterday and knew I wanted to work with this topiary image and I thought it would look great pair with embossed leaves from In Bloom. So the original color combo was ripe avocado, brown, kraft and cream. I played around with different layouts, different buttons, whatever I could think of! Nothing was working! So I though enough is enough and left to go to my work out class. I guess getting a good buns kicking work out must have kick my brain into gear! As soon as I got back I took one look at my card and thought "COLOR!" So that's when the raspberry fizz came into play and everything else just fell into place. It's kind of hard to tell in the pictures but the leaves are embossed with clear embossing powder. The topiary pot was stamped a second time and cut out, then mounted with dimensional adhesive for a little bit more dimension. For the selection of the buttons, I thought it would be neat to pair a fun textured button (top, but it's hardly noticeable) with a simple one (bottom). I think it turned out all right, considering the struggle I had with it. Thanks for stopping in! I hope you enjoyed spending a little time with me today. Happy Friday!!! Yeah the weekend is almost here! Today's card it based off of the Fall To Layout #54. Here is my take on it... Yes, it is a skinny card again, hope you aren't bored of them yet! :) Anyways, today's card is super simple, it literally took me about 10 minutes to make! To create the black frame all I did was cut a piece of scrap cardstock to the size needed, rounded the corners (still using that corner rounder, just in a different way! Got to love that tool!) and traced it with a black ultra fine point Sharpie. I made sure to leave space for the sentiment. I wanted "sweet" to stand out a bit more, so I embellished it with some bling. I use my Everyday Button Bits again, it has such a great assortment of images! Using the cherries today, I stamped the stems in ripe avocado onto a spring moss circle. Added two berry sorbet buttons, stitch with black floss, to match the frame. Then just popped it onto the card making sure to extend it over the edge. So that was it! Easy Peasy!!! What do you think? I think this weekend will be another laid back weekend for us! Do any of you have any big plans? Well, hope you have a good one. Thanks for stoppin' in today, hope you enjoyed! Come back soon! Hello my friends! 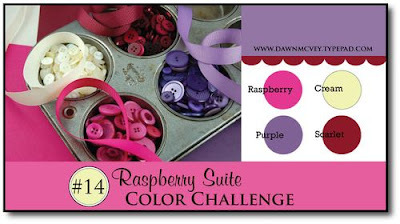 So it's time again for Dawn McVey's Raspberry Suite Challenge. I tell ya, this was a challenge for me. First it took me forever to come up with and idea and once I did, it kept changing. Second I found it hard to combine these colors without a dark neutral, like a brown or black. I kept wanting to throw a green in there too and do flowers, but I refrained. So here is my take... I went with a skinny card for this one, they are just so much fun! I inked the balloon baskets and sentiment in burgundy. I don't have Scarlet Jewel (yet!) so I improvised and used a burgundy ink and button I had in my stash. I used SU Perfect Plum for the stamped background and had a purple button in my stash, for the balloon. I have tons of Raspberry Fizz so I pulled out my "bag o buttons" and GG ribbon. Aren't these Hot Air Balloons too cute?! Its so perfect for Papertrey Ink to create a set made for buttons, it's a great way to incorporate any color combo! So hope you all have a great Thursday. The weekend is almost here! Yeah! Hope you enjoyed the card and thanks for stoppin' in, come back soon! Happy Wednesday! Today's post is going to be a quick one. My son and I have a picnic lunch to go to with friends and I'm running late! So, the card I'm sharing with you today is "Just A Little Something" I whipped up in no time... I love the bold color with the pop of white. This card is for you Jessica, I know how much you love pink! The background image was stamped and embossed in white for a little extra texture and pop. Don't you just love that button! It totally looks like it's on fire! So I hope you liked today's super simple card. Have a wonderful day and hope your week is going great! Talk at you later. Hello my friends! So I've finally taken a step back from my In Bloom set. :) Today I bring you this cheery little card... I use the Beyond Basic Borders tree again. This time I gave it some foliage! I punched a circle from spring moss cardstock and stamped text in Ripe Avocado (did this along the side of the card as well). Topped it off with a flowery button. I'm really enjoying adding buttons to my ribbon accents, it's a fun switch from the usual knot or bow. I love how simple this card is but at the same time it's loaded with lots of texture and interest. The torn cardstock strip adds a bit of texture, I just tore it by hand and curled the ends up a bit. It was super easy! The ribbon and the buttons all have their own great texture and shine to them. Extending the tree top and sentiment over the edges adds a touch of interest, as does the stamped text background. Oh, and of course the rounded corners (gotta love that corner rounder... lol). So what are some of your favorite ways to add texture and interest to your creations? I hope this was a nice change from all those In Bloom cards. :) Glad you stopped in for a visit, now you all have a wonderful day! Happy Monday to you! Hope the weekend didn't go by too fast. I used my apron lace border punch on kraft cardstock, then stamped text using raspberry ink onto the punched border. A small and a large flourish were stamped behind the bloom, its amazing how flourishes just add the right touch to a card. I added a little something special to the center of the bloom... The way I cut and layered the bloom enabled me to tuck a little black button in the center. Just thought it was a unique and cute little detail. It's the details that count right? I hope you liked the card today. So, just like the sentiment on the card... Thank You for stopping by today and for all the wonderful comments you leave me. It's like a little bit of extra sunshine in my day, I love each and every one of them! Since the sentiment is so long I chose to layer the sentiment over the image. The sentiment comes as one stamp, but to get the two colors I carefully inked up one side in brown and then the other in raspberry. Then placed a few buttons in a way to help draw the attention to the sentiment. Are you loving this color combo as much as me? I think it may be one of my faves! Oh, and can you believe it, I resisted the corner punch on this one!!! LOL! Hi there! Hope you are all enjoying you're weekends! This flower image would be fabulous all colored in, but I am not a colorer at all! lol! So my way of adding color is to stamp the images in different colors. The large bloom was stamped in Raspberry Fizz and the smaller ones were stamped in red. I stamped the images multiple times and cut out different sections of each flower, then adhere them together with dimensional adhesive to give it a layered look. Just like Nichole Heady did for this card. I gave the card a little extra detail with black rhinestones, black scallops and a sentiment stamped in black as well. Again with the "skinny" card, it just makes such elegant cards. So this may seem like a lot of work for a card, since this is the first time playing around with this set. But I have had this idea in my head ever since ordering it and couldn't wait to create it. It turned out just like I had envisioned, which rarely happens. Usually my cards come out completely different from the original idea. How about you, do your cards usually come out as planned or off on some other tangent? So, I'm loving this set and have already made a few more cards with it. I look forward to sharing them with you soon. So hope you'll stop in again soon. Talk at you later! See that tread like detail, it's a perfect fit! Did you notice the button threading? Just thought I would try something new (sorry for the glare), I thought it might make the bike look like it's in motion. Not sure if it worked. It is a cute detail though! If you guys haven't noticed already, I love my corner rounder!!! I use it on almost every card, it just adds a nice subtle detail. Don't get me wrong, I love all my punches but this one just seems to fit every card no matter what the style is. Do any of you have a go-to tool like this? Anyways, I have a birthday celebration to go to tonight (my niece is turning 5! ), but other than that no big plans for the weekend! Hope you all have a wonderful one! Hey there! Hope you are having a good week. The flower button and ribbon detail (one on the left side) is one of my favorite things about this card. The button is adorable, but it only had one large hole in it. So I tied a knot in the ribbon, strung it through the hole and wrapped it around the card. Such a simple detail but it adds a lot, going to have to do it again! So what do you think of my frosted cupcake? Does it look good enough to eat? I'll pretend it's my sisters homemade frosting, she makes a killer cream cheese frosting! Lol! Mmmmmm! Today's card was inspired by this photo in Better Homes And Gardens Magazine, August 09 issue... This photo really stood out to me because of its bold, bright and fun colors. This is not a usual color combo for me, I'm not really a fan of purple and don't usually go so bold; but I just love how these colors came together in this bouquet. Here is my interpretation... The colors used were: Raspberry Fizz, Ripe Avocado & SU Perfect Plum. I have a very small stash of purple cardstock (one 12X12 sheet) and this card almost used it all up! lol!. I may not be a fan of purple but the other two are a couple of my favorites. Ok... I guess the purple is kind of growing on me. :) Maybe it just needs to be combined with the right colors. So how about you, what are your favorite colors or least favorite colors? Do you like to go for Bold & Bright or Soft & Subtle? I'd love to hear your take! Hope you have a wonderful Wednesday!!! Thanks for visiting! Wow, look at me... no polka dots this time! :) To make it look more like a flower, I gave it a green center using a smaller Spring Moss button. Three buttons are place on the right side of the card to help balance out the massive button and to make your eye flow along the card from left to right (to make it visually pleasing). I'm sure you've already noticed, but I've been trying out a new card size. This card measures 7" X 3 1/2" (7"X7" folded in half). It's fun to work with the extra length and it looks great with lots of blank/open space. It's easy to work with visually too. Thanks for stopping by today! Hope you have a good one! Hope everyone had a great weekend! I had a very productive one, finished painting the ceiling in one day! Very glad its done! I prefer to do my stitching by hand with embroidery floss, I really like the thicker stitches and prefer the look. I'm also too lazy to keep lugging the heavy sewing machine in and out of the closet. :) Here I did a Zig-zag stitch along the seem of the two polka dots. I'm not sure if Zig-zag is the correct term exactly, but that's what it looks like to me... lol. The button is threaded with the same brown floss to match the stitching. Here is a tip I find very handy: Make sure to pierce all the holes, with a paper piercer, before using the needle and thread/floss. Its much easier on the fingers. I'm really liking this color combo, Chocolate with berry and orange. This combo was made for cupcakes! Polka dots were made for cupcakes too, hope your not tired of them yet. I really like the way this card turned out. It's cute, simple and has lots of fun details! Hope you like it too!